You. Me. Ride This Crazy Train - Adventures and Observations on The GO: This is why you have car insurance, so you don't have to run away when you smash someone's car! This is why you have car insurance, so you don't have to run away when you smash someone's car! Unless you *don't* have car insurance. 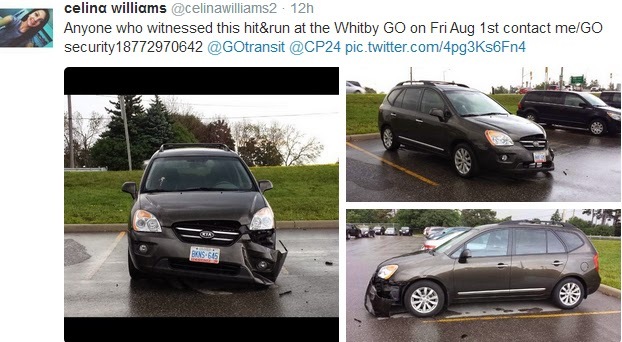 This hit and run happened Friday, August 1 at the Whitby GO Station. Celina posted the incident to Twitter appealing for witnesses. If you're the person who hit Celina's car, how do you explain the damage to your car when you arrive home to your spouse? Or your neighbours? Hey CJ. Her twitter post says whitby GO...just pointing it out! :).hopefully she finds out who did it! Sorry, I had Oshawa on the brain. It looks like Celina's car was sticking out into the aisle (the lines end around the front wheels, unless she moved it before taking the pictures? ), but that doesn't excuse the person who hit it and took off. It probably wouldn't have happened if she'd parked properly, though. You will be covered by insurance regardless. Your car was parked and got it. It won't affect your insurance premium as you will be considered not at fault. My insurance company waived my deductible if I filed a police report. Why is the van so far out? How she parked doesn't excuse anything. I usually drive with two eyes open. I've managed to make to the age of 40 never once hitting a parked car regardless of how it was parked in a parking lot. It looks like the guy besides her on the drivers side of her car pulled her bumper off by cutting the corner too close when pulling out. Look for somebody with damage on the rear passenger side around the back wheel and door. Possibly a pickup of flatbad truck. The driver probably didn't even feel it or hear it, with the radio on loud or talking on his phone. She could park better, but no excuse for what happened or leaving the scene. $2k damage it looks like. New bumper skin, some hangers and frame bits, a little paint and she'll be almost like new again, except for the ding in her front fender. "Clearly" judging by this photo the car's wheel is sticking half out of the parking spot - making 3/4 of her front end hanging outside the parking spot regardless of the damage. She got what she deserved for parking like an idiot. ^ and a woman dressed provocatively deserves to be sexually assaulted? That kind of logic? Parking like an idiot can incite rage in others who contemplate, at most, leaving a note with a swear word in it. Deliberate damage to a car is a crime and never warranted. We should be concerned by the ones who follow through and smash a car because it wasn't parked as far back as you would like. This is when you call it in to transit security. Maybe leave a note calling the person an idiot, but you don't deliberately damage the car. Sorry, I'm not buying what you're selling. I agree with Cj Smith. Parking donkeys drive me nuts and although I've fantasized smashing the car to bits it's another to actually do it but I don't think this was deliberate. This was probably someone who came around the aisle too fast and didn't expect to see a car sticking out and boom! So this bears the question, what if that had been a person standing there putting windshield washer in the car? Doesn't a body stick out? Does a person standing in a parking lot deserve to get hit? The thing is, it's a parking lot and we all should be diligent and aware. I hope Celina's car gets fixed and maybe she will consider backing up a little further in spaces but in no way did she deserve her car being trashed. That's just low. Deliberate or accident, it's low. I always reverse into my spot until the back wheels touch the curb. GO could do a better job with their security camera, which I'm sure didn't catch anything. When to they ever? Coincidently none of the new bike GO patrol were on duty either to see anything or intervene? It's wierd how serious C.J. been's getting. I'm not used to some intelligent replies that aren't joking in nature. I like it when she's mean and sarcastic. I also miss the funny text messages and lost and found. ^ It's only temporary. I don't like being serious on here. I'm serious enough in my personal life. My online persona is my outlet for immaturity. Not to worry, C.J. will return. From what I can see she's only parked a couple of feet out from the curb ... doesn't justify a deliberate, selfish, act of violence which is costly for both or all parties involved. Maybe she had a large artical in the trunk to remove and wanted the space to maneuver such an item. I am not surprised, disgusted but not surprised. I hate the whitby GO parking lot and the lack of consideration, most of the drivers are selfish twits. Regardless of her car sticking out a bit no one should cause that kind of damage and leave without taking responsibility. I hope someone witnessed it and has the guts to report it. I am betting that a car parked in the row in front of her back out and hit her, if it was a truck they may not have much damage. Maybe the fact that she was out a little more came into play but seriously, why are people blaming her parking for this? It doesn't excuse the behaviour of hit and run. .. you should be careful backing up that far ... not all curbs are the same height or size... you may actually cause damage to any low mounted parts on your car .. some of which can be very costly/dangerous if damaged. @ Anonymous 6:52 Unless you are driving a sports car I wouldn't be worried about the undercarriage and pretty sure KIA do not make a vehicle with an undercarriage low enough to damage the car. Backing up 6-10 inches makes a difference. The GO parametres and curbs are virtually all the same being 6-8 inches. I'm with you JulieBean. The Whitby GO lots are a frickin' free-for-all most days. Stop sign? Pffft. Plow on through! Let's go through the parking garage like one is driving the Indy 500! Newsflash, people, you aren't Indy drivers!! Slow the eff down! It isn't just the Whitby Station.